I think it’s fair to say I am a Glossybox addict. I’m yet to receive a box that disappoints. If truth be told my only criticism in 5 months would be that I received two brow products back to back in the October and November boxes. First world problems right?! If my brows are not on point this Party season Glossybox can’t be held accountable. 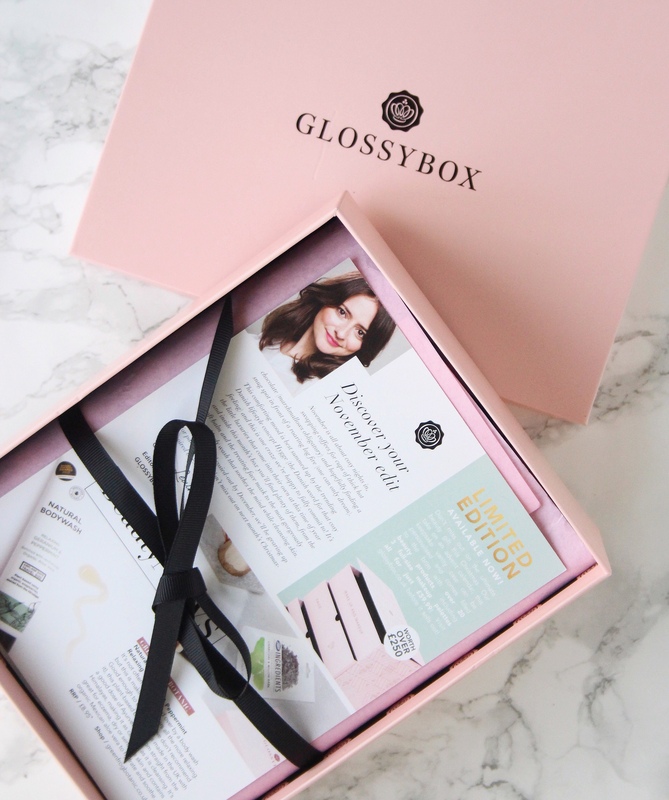 I always like to start my post with a round up of what Glossybox is and link to my previous unboxing post. 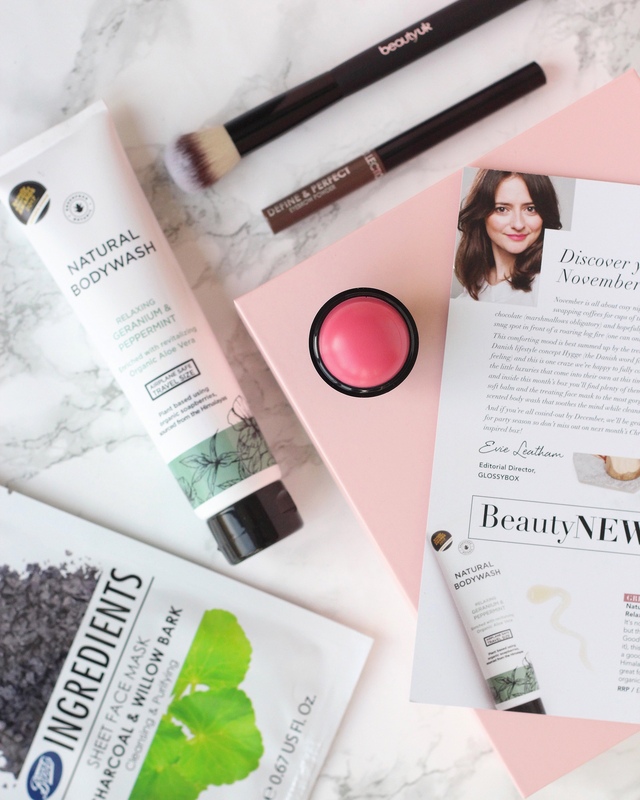 So if you’d like to see what I received in my October Glossybox you can read my review here. It’s a subscription beauty box with a curated selection of 5 – 6 makeup, skincare and hair must-haves. The price varies depending on the length of your subscription. Once signed up you can create a beauty profile online to ensure the products are tailored more specifically to you. December was due to be my last box but I’ll be renewing my subscription. November saw a move back to the original Glossybox packaging and the focus was very much on cosy nights in. 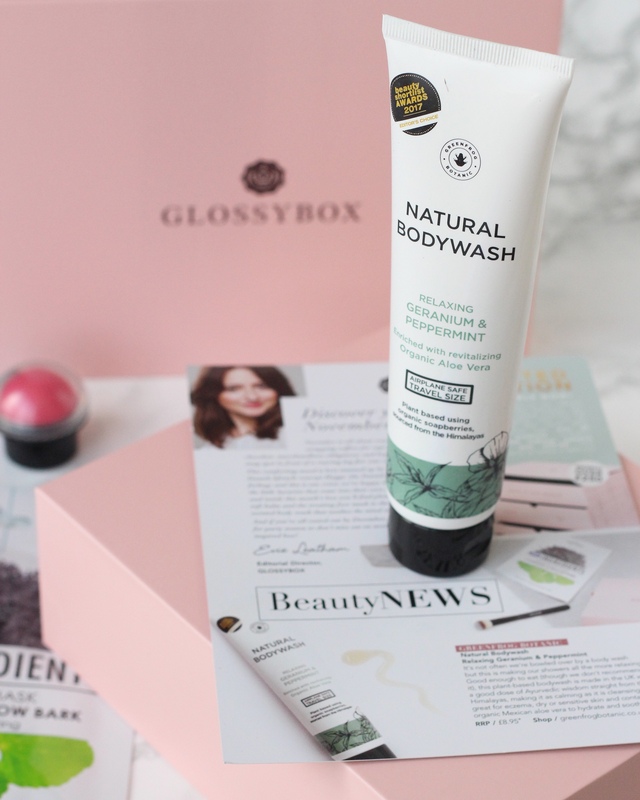 With a relaxing bodywash and a charcoal face mask, I can totally buy in to the Hygge lifestyle concept Glossybox looked to achieve with this box. The gorgeous smell of this bodywash was the first thing that hit me when I opened my box this month. I find the smell of peppermint so refreshing, especially in the mornings so this has immediately replaced the current bodywash I have in the shower. Made from organic soapberries (essentially a plant that contains Saponin which helps create that soap-like foaming) this bodywash is calming on the skin and has added aloe vera which should help replenish the moisture levels in your skin. I couldn’t be happier with this one and it’s a travel size. If only I could hold on to it until I go on holiday in January. Not going to happen. If you read my unboxing post last month, you’ll know that I cleaned my makeup brushes for the first time EVER. I can’t believe I’ve actually thrown that statement out there. I’m certain I’ll be struck down for my sins on the beauty world. If that doesn’t happen, I’m very much looking forward to getting many uses out of this brush. The bristles are so soft, I spent about 10 minutes sweeping the brush over my face without actually applying any product. Crazy, yes, but if you have this brush at home I am sure you will agree with me. 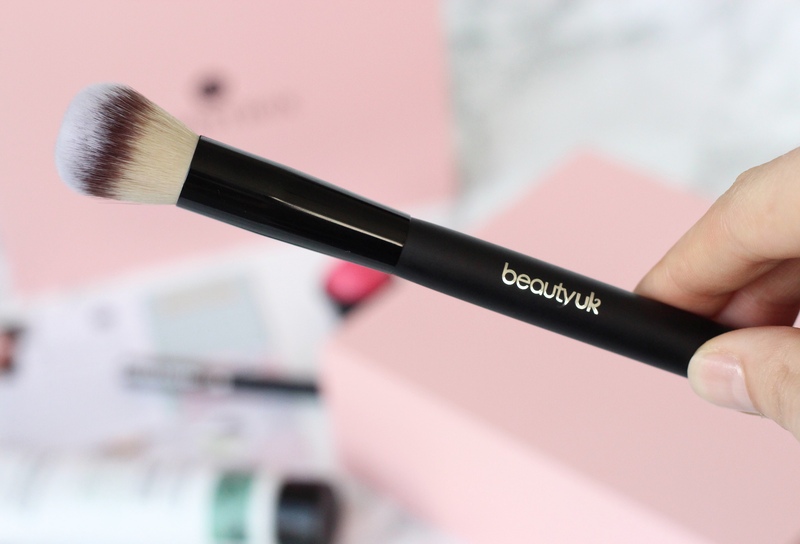 It’s perfect for contouring but I’m less likely to use it as a full face powder brush. Say it with me folks, winter lips! If you’re working that trout pout for your selfie portfolio you’ll want to get your hands on one of these. Every time I apply this lip balm I feel like I am being transported to a fairground packed with candy floss. 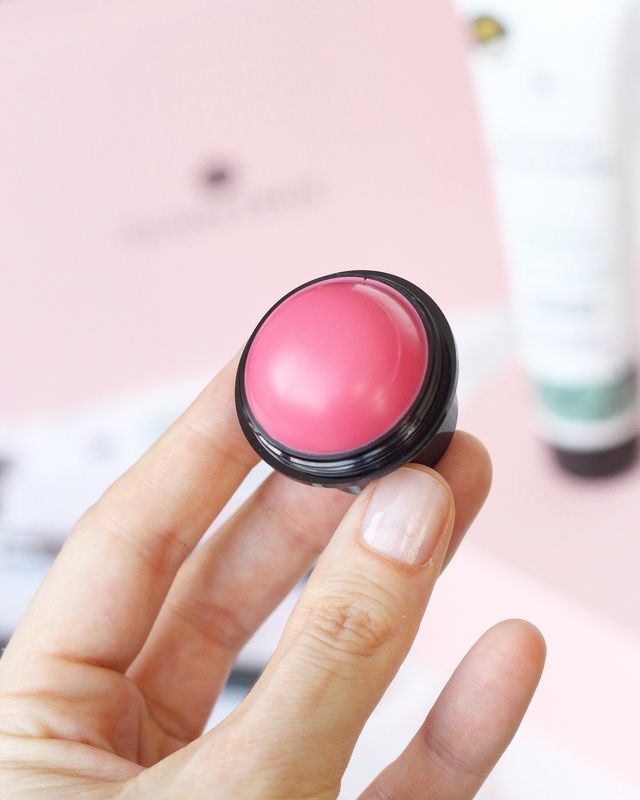 It’s not just pretty to look at, the lip balm is actually infused with with SPF15, vitamins and antioxidants. What’s not to love really. I think the rounded shape is great but I do wonder what application will be like when the product is almost finished. How far down does it go or is there just a flat surface. Only time will tell. 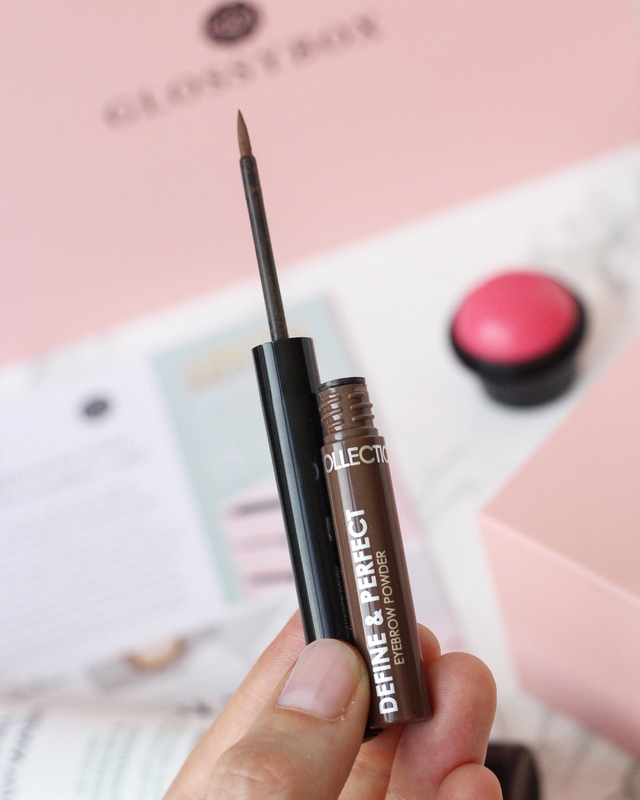 As I mentioned in previous posts my brows have been quiet the talking point on my blog. Having said that receiving two brow products back to back was a bit much, even for my under perfoming brows. Nevertheless, I put the eyebrow powder to the test. Application was fine and I found the colour a much better match to my brows than the Lord & Berry brow pencil I received last month. My preference would still be the pencil for application. I didn’t get to choose a colour option so if I had darker brows I might not have been able to use this powder. I’m new to sheet masks and have only tried one other prior to using this. Aside from the fact that they feel like they been marinating in some ‘special sauce’, they do give off a certain ‘crazy’ look. So you can appreciate why I’ve been hesitant. I was really looking forward to using this one, especially as it contains charcoal. I’ve read so many good things about the purifying effects. Alas, it was not meant to be and I barely lasted 5 minutes. I had to remove the sheet mask as my face felt like it was on fire. Perhaps sheet masks and I aren’t meant to be together. That’s my round up of the November box. I cannot wait for the December box as we were given a little sneak peak of what’s to come. It sounds like a good one!